Sorry for the lack of a Friday Flashback as I had to work yesterday and had to go to the funeral home before the dinner plans I had last night. All of that resulted in no time to do a post yesterday. However, I thought I would try to make up for that with a post today. I am not sure what the weather is like wherever you are, but here in Kentucky it's 70 and beautiful outside. Heck, I even saw a few yard sales going strong this morning. Which means it will only be a matter of time before the sound of lawnmowers strikes out across the bluegrass. 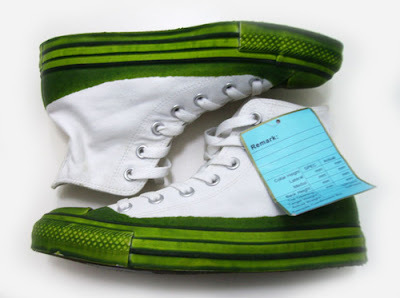 Speaking of grass, these sample Chuck Taylor All Stars are perfect. With these shoes you can go ahead and throw out those beaters you've been mowing in for years because these shoes come with the grass stain build in. 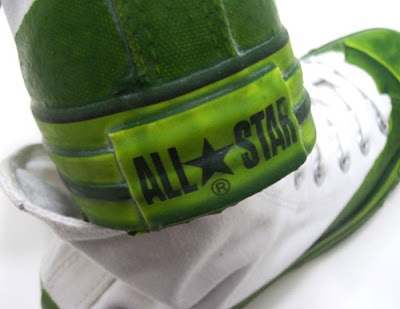 You can have the comfort of new shoes without worrying about staining them green. I am not sure if these will ever release, but it is a really interesting take on the All Star's. I also want to wish my Kentucky Wildcats good luck against the Gators of Florida, because we really need to win! Thanks for checking out the blog and please tell everyone you know to check out The Converse Blog.